Cardiff Blues progressed to the EDF Energy Cup semi-finals after a well deserved 24-18 home win over Bath in Cardiff on Friday night. 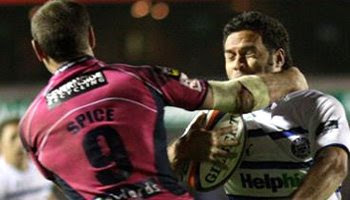 In the second half Bath were awarded a penalty try after wing Joe Maddock was prevented from scoring a try. The resultant kick conversion was pretty interesting too. It all came about from a fantastic passage of play, sparked by the ever impressive kiwi winger Joe Maddock who streaked through the line of defence and looked set to score a fairly simple looking try. As he stepped inside the covering defence though, it was another kiwi, Jason Spice, who stuck out an arm and caught Maddock around the neck, sending him spiralling to the ground. The referee, Nigel Owens, awarded a penalty try but decided against the yellow card as he felt the tackle from Spice was accidental. Maddock, who was probably still a bit dazed following the incident, had his kick charged down from directly in front of the posts, as Richard Mustoe shot off the line. An interesting clip, with some perhaps thinking that Spice should have been yellow carded too. Opinions will vary no doubt. Great running from Maddock.. I think the call was fair, it looked accidental, not malicious. That is the first time i've seen a conversion been charged down! Stephen Larkham charged one down in a test against the springboks in 2000 I think. It was brilliant. was butch james off the pitch? why did he take the conversion himself? I agree with Cory - looked like Spice just got caught with a sidestep and tried to recover, nothing deliberate I think. Good call and great rundown of the conversion! I'm surprised its not fully attempted more often. not intentional but still a high tackle which is a yellow surely? hmm..if u give a penalty try..some1 should be yellow carded right? Our winger charged a kick down once. Had something to do with the very long run up their kicker had! Our kicker got to the tee before he did! wasn't malicious but I thought it is sort of a rule that any incident deemed severe enough to give a penalty try, also deserves at least a yellow card. it was an absolute yellow card. nigel owens is welsh,... no? I am pretty sure the ref got that completely wrong. As i understand it a penalty try is not given as a punitive measure, that is the role of the yellow card. A penalty try is only given if the conditions are such that without infringing the laws a try would otherwise have been scored. As such to award a try in this incident you would have to argue that had Spice not made the high tackle a try would have been scored. This is a hard case to make as if he was able to get a hand on him then he could likely have made a legal tackle - although this, obviously, does not apply to all situations. In this case i reckon it should have been a penalty on the 5 meter and a yellow for Spice. the charge down was perfect..he started running at the same time as the kicker did..
simon says "yellow. . ."
puta** le vieux cul de catin abusé! le pire c'est qu'ils se font contrer juste apres lors de la transfo! il n'y a pas de justice...dans le rugby surtout pour les clubs français mais ça c'est une autre histoire. bath est une tres belle équipe! avec sale ils iront loin! mais pas trop et ni avec leicester car l'USAP vaincra!!! GOOOOOO USAP! Lol Danny shui anglais mais j'ai vecu en france pendant 6 ans a Paris. je sui daccord avec toi ke lusap ira plus loin ke ces 3 autres ekipes surtout avec l'arivée de Dan carter, et nous avons vu dernierement ke Perpignan a battu leicester. In response to the anonymous post, saying the ref got it completely wrong and it should have been a 5m penalty, I think Bath may have had some complaints since Maddock managed to score anyway. I think it was a good decision as Maddock would have probably been under the posts otherwise. Yellow card is 50/50 depends whether it was intentional or not which is pretty hard for a ref to judge.